President Julius Maada Bio Receives the Final Report of the Ministerial Meeting of the African Union Committee of 10. _Radisson Blu Hotel, Freetown, Saturday 15 December 2018. His Excellency President Julius Maada Bio has received the final report and recommendations of the two days Ministerial Meeting of the African Union Committee of 10 (C-10) on reforms of the United Nations Security Council (UNSC). Before he presented the report, Sierra Leone’s Minister of Foreign Affairs and International Cooperation, Dr Alie Kabba, thanked members of the committee for their relentless efforts and for ensuring that Africa took its rightful place in the UNSC, one of the six principal organs of the UN, charged with the maintenance of international peace and security as well as accepting new members to the United Nations and approving any changes to its United Nations Charter. Dr. Kabba noted that he was very satisfied that the meeting did justice to the wish and aspiration of President Bio, who is the current Chairman of the Committee of Ten African Heads of State, noting that the president had entrusted them with the responsibility of deliberating the issue on the reform of UNSC and of finding a clear roadmap on how Africa should achieve a legitimate common goal. He further stated that the meeting had developed a new sense of focus for Africa and added that he was sure that Heads of State in Africa would look into the recommendations of the Freetown Meeting when they meet next. “We have developed a new sense of focus for Africa and I am sure that this will help our African Heads of State and guide them to device a common African position on the reform of the United Nations Security Council,” he confirmed. The minister also mentioned that in Freetown members of the committee were bold, courageous and fearless in bringing out recommendations for Africa to take her place in the UNSC. He, therefore, encouraged everyone to work with the various Heads of State in ensuring that Africa became great. The African Union Commissioner for Political Affairs, Her Excellency Madam Minata Samate Cessouma, expressed great satisfaction at the outcome of the meeting that was held in Freetown. 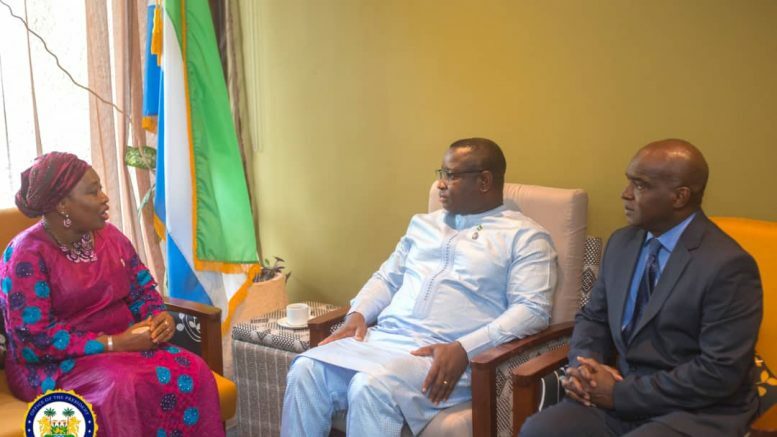 She also registered her appreciation of the kind hospitality Sierra Leone had offered them during the course of their deliberations in Freetown. She, however, said that the commitment of that meeting demonstrated how serious Africa had become to say no to the social injustice, by refusing Africa a place on the UNSC. “I am personally happy that this meeting has demonstrated the highest sense of belonging and that Africa is ready for her legitimacy in the UN Security Council. The Freetown meeting has also mapped out strategies to accept the challenges ahead of us if only we are to take our position on the Security Council,” she stated. Before receiving the report’s recommendations and outcome of the meeting, President Bio said he was happy to witness the end of a fruitful, highly motivated and inspiring meeting of people with a common goal and agenda to see Africa standing tall on the United Nations Security Council. He referred to members of that meeting as a resilient and hardworking people who might have had a series of disagreements in reaching the final agreements in the report, but expressed hope that their effort would see a new Africa and her trajectories in the UNSC. “Your work is purely a labour of love for the right and dignity of generations of Africans. I will communicate these recommendations in this report promptly to my fellow Heads of State and governments. This is a strategic framework that will constitute a roadmap for our future discussions and engagements,” he noted. President Bio also stated that Africa’s call remained simple that Africa needed an equitable representation on the United Nations Security Council and all other organs of the United Nations. “These recommendations show that we are moving toward actualising Africa’s demand of two permanent seats with all the rights, privileges and prerogatives of current members, including the right to veto and two other additional non-permanent seats in the United Nations Security Council,” President Bio emphasised. He stated that those recommendations in the report would be the most valuable argument that Africa could present on behalf of her 1.2 billion population, the second most populous continent with the second largest landmass on earth. He therefore entreated everyone at the meeting to be guided by the strategy and principles of those Freetown recommendations. He referred to the messages of Africans over the social injustice at the UNSC as a continental aspiration. State House Media and Communications Unit.